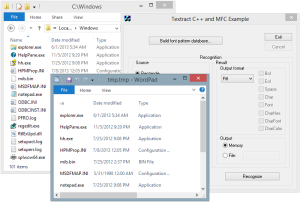 Summary: Textract screen scraper SDK can feed a program you develop with the text data from an existing application. It works even if this application does not support any communication API. Textract captures image directly from the screen and converts it to text. 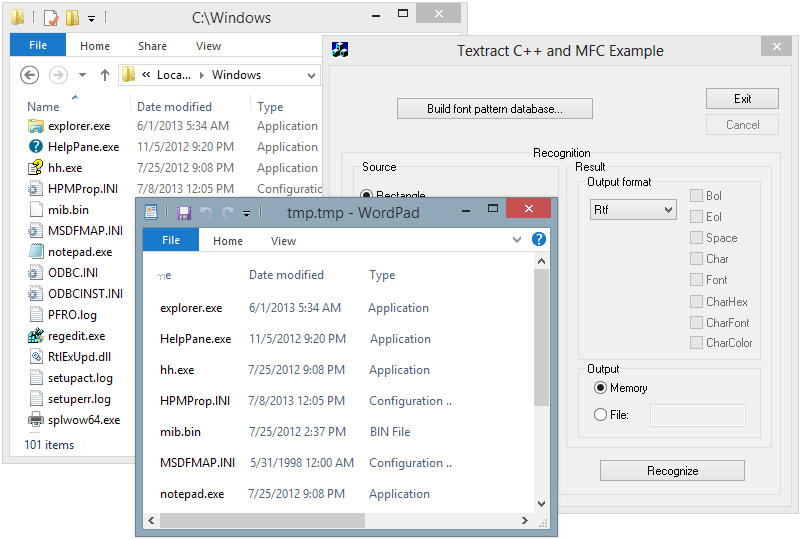 Textract has OCX and DLL interfaces and console mode EXE. Windows versions from XP to 10 are supported. Free 40 day trial. Released in 1999. Many corporations use Textract in their redistributable software, most of them in the USA. Typical Task in Software Development: new software need to read text data from an existing/legacy application. Recurring Problem: existing/legacy application can not export data to other programs and can not be changed. Example 1. Banking: need to use cash dispenser program when teller terminal going to dispense money. Dispenser program has to get customer information and amount from the teller terminal. Terminal may not support data export to another program. Example 2. Medical: need to read data from the existing HIS (Hospital Information System) software. HIS display patient data like ID and name on the screen. Typical HIS application will not be able to export data in a form readily accessible by the other program. Example 3. Quality Assurance in Software Development: new application displays text on the screen. A test program reads displayed text and its exact location without interaction with the new application. It compares this text with expected results. The only clean way is to capture the image from the screen. But this image is a bitmap, not a text. Idea and Solution: capture screen image and pass it to the OCR engine that transforms bitmap from pixels into actual text. Textract screen scraper SDK is specifically designed to recognize texts printed on the screen by the Windows graphics system. Compatibility: Supports Windows XP – Windows 10, including standard and Clear Type fonts smoothing. OCX/ActiveX: best suitable for Java, Visual Basic, Java Script and other high level development environments. Console mode EXE: best suitable for perl and other scripting, and to make fast experiments with the screen scraper. You develop software for MS Windows. It connects existing systems programs. You have to read text data from a system that cannot interact, but shows all required info on the screen. You can use OCX/VB Control, DLL or EXE from your program. You need one copy or royalties are okay or you may prepay for the unlimited license. Confirm the Textract Checklist above. Clear any doubts with Customer Support. Download Textract 40-day trial and integrate it into your software. Discuss the deal with StructuRise customer support and place an order. Distribute your software with a new capabilities.